Below is a listing of our current inventory of Arts & Crafts era artwork. 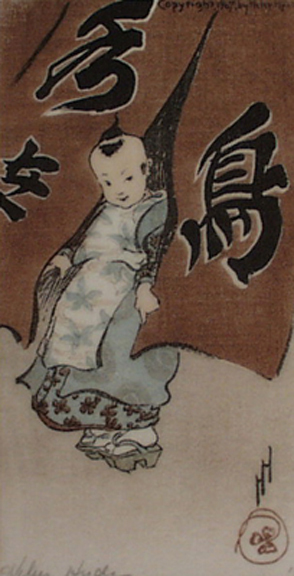 Most works are color woodblock prints but there are some color etchings, oil paintings and watercolors as well. We believe this listing is one of the largest collections of vintage Arts & Crafts artwork available in any one place. Unless otherwise noted, all works are hand signed and all defects are noted. Shipping is at cost (about $25 for most items; more for larger pieces). Please contact us for a quote. Please go to our conditions of sale page for full details. Please contact us for pricing. Please see our "Publications" page on this site for an article we wrote on Arts & Crafts prints in America. 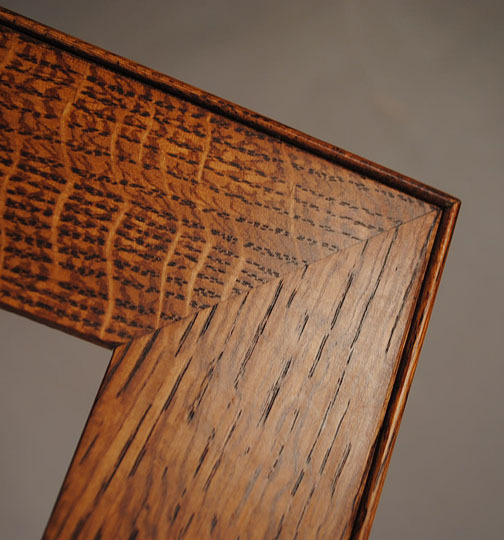 Unless otherwise noted, all works are framed in new period style oak frames. 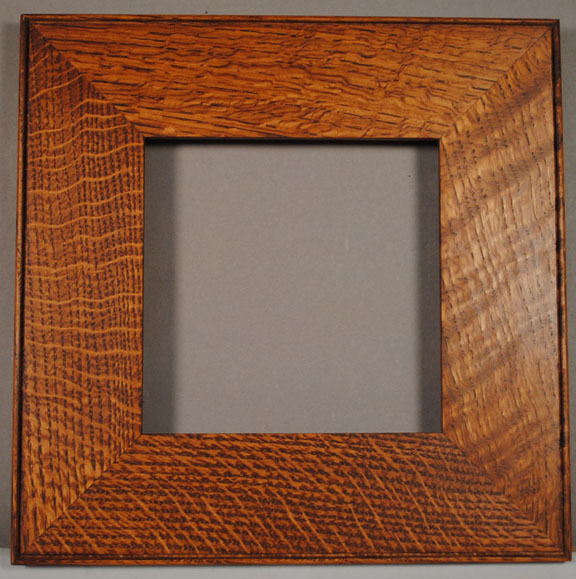 These are an exact replica of a period frame I gave to a good friend and talented furniture maker, Josh Metcalf, who has faithfully recreated the framing using hand-selected oak and his skilled craftmanship. Views of the framing are in the first three listings, below. Of course, the artwork can be purchased without the framing if you wish (but don't tell Josh). Josh might be able to make custom frames for you, depending on his schedule. You view his website to see the amazing furniture he can create (and you can email him off of his site). Most of his orders are custom commissions. To give you a rough idea of the framed size, most prints are matted with about a 2" border all around and the frame molding is 2 1/2" wide. This is an example of the framing used in most of the artwork on this page. This is a faithful copy of a period frame that I gave to Josh to replicate years ago. Of course, graining will be different on all frames. These frames are hand made and splined on all corners and hand finished by Josh. 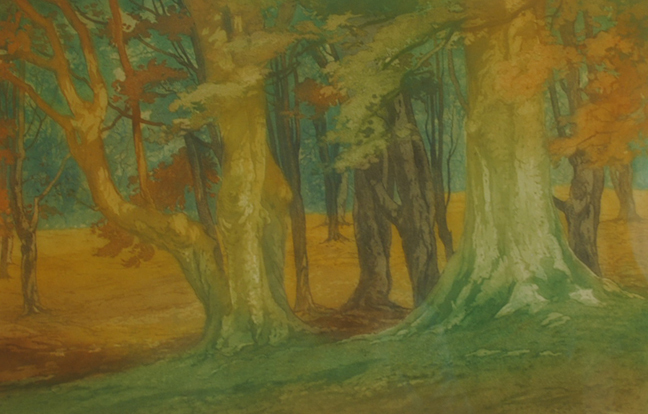 "BEECHES, EPPING FOREST,” color etching & aquatint, 1914-15, ed.50, 10 3/4 x 16 3/4.” Signed in pencil. $1350. Another impression of this print was exhibited at important The Panama-Pacific Expo in 1915 as well as at the Chicago Society of Etchers exhibition in the same year. For a good discussion on the artist see A Spectrum of Innovation: Color In American Printmaking 1890-1960. 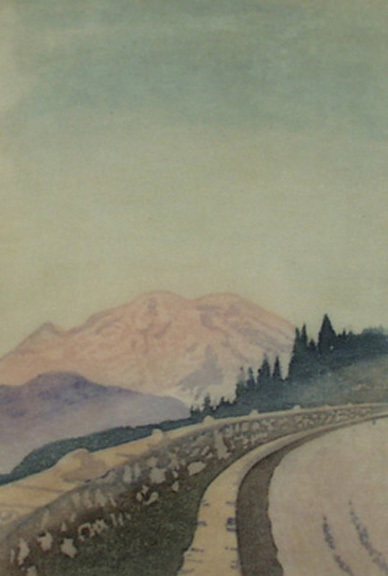 "LAGUNA COAST,,” color etching & aquatint, c. 1923, ed.75, 15 x 9 1/4.” Signed in pencil. $2750. With a fragment of the original matting identifying the artist and giving the title. Titled on a label on the reverse of the original frame and noted “Edition Exhausted.” Another impression of this print was exhibited in the March 1923 exhibit of the Chicago Society of Etchers at the AIC. For a good discussion on the artist see A Spectrum of Innovation: Color In American Printmaking 1890-1960. 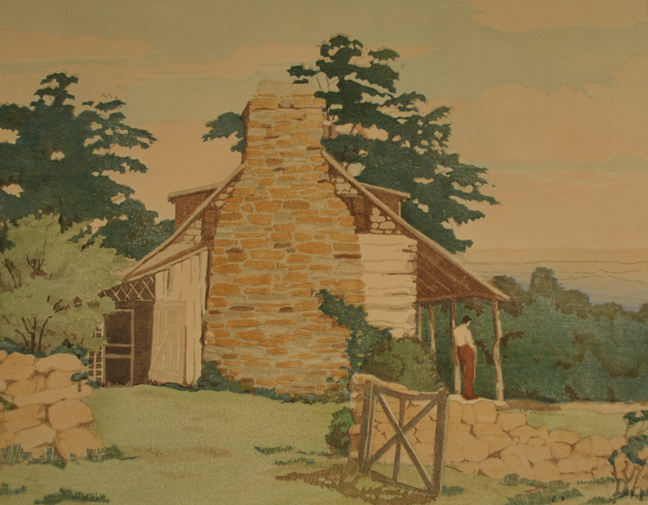 "OLDTOWN HILL, color metal relief print, 1901, ed. c. 800*, 3 x 4 7/8.” Unsigned as usual. $950. An “Ipswich Print” not included in any of the 3 portfolios. These prints were printed by hand on “a foot-powered press. * Intended as teaching aids, many did not survive the years. Noted in letterpress in lower margin: “THE IPSWICH PRINTS, Series C, Print No. 1, Three colors. Copyright 1901 by Arthur W. Dow.”. 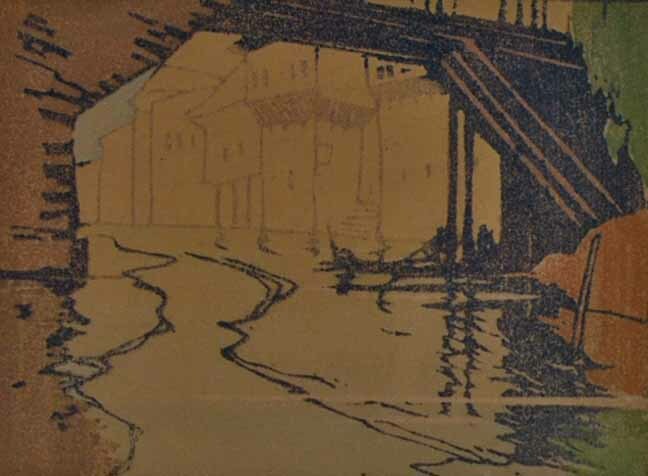 “RIVER RELECTION," (Yellow), color woodcut, c. 1910, ed. small, 11 x 8 1/8.” Unsigned as is most common. $2950. This is a good example of how Dow liked to vary the coloration of the same blocks to create a wholly different mood, time of day or season. Provenance: from the estate of an heir of the artist. 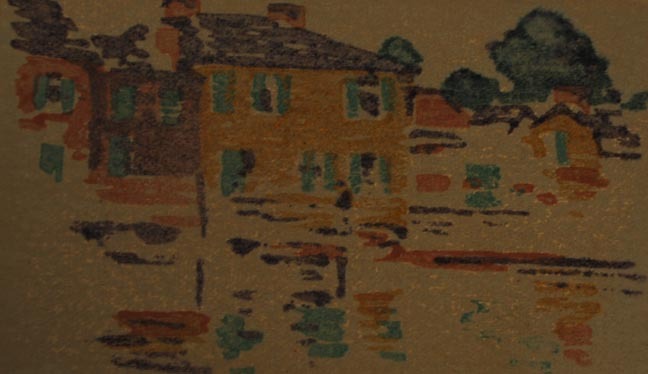 “RIVER RELECTION," (Gray), color woodcut, c. 1910, ed. small, 11 x 8 1/8.” Unsigned as is most common. $2950. This is a good example of how Dow liked to vary the coloration of the same blocks to create a wholly different mood, time of day or season. Provenance: From the artist’s estate. “[TOWN SEAL OF IPSWICH,” color woodcut, c. 1895, ed. unknown, 2 1/4" in diameter. Unsigned as usual. $450. Dow created this town seal for his beloved home town of Ipswich, Mass. It was also adopted by use of the Arthur Wesley Dow Association of Los Angeles. 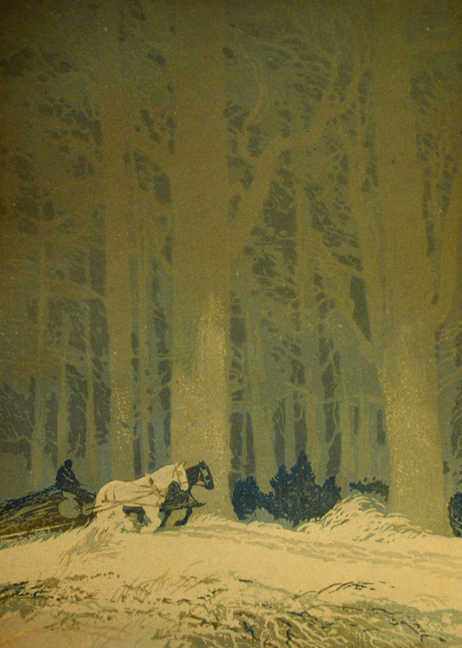 [DUNES IN SNOW], color woodcut, c. 1930, 14 x 9 1/2." Signed in pencil. $775. 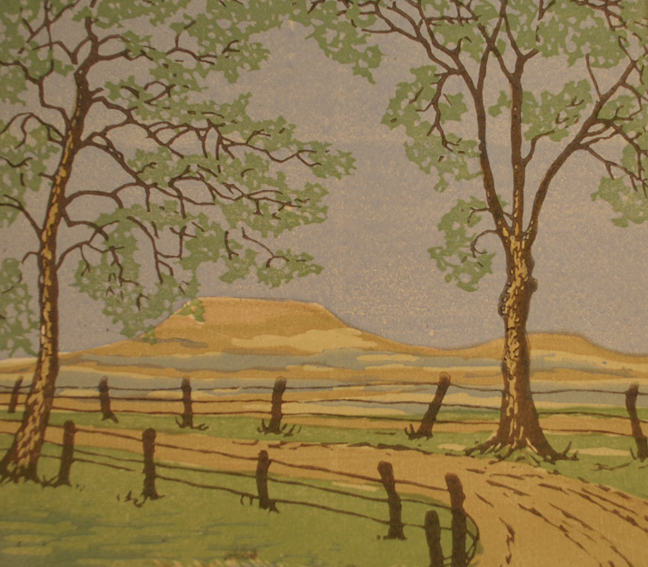 "SPRING IN THE MOUNTAINS," color woodcut, 1933, 14 1/8 x 9 3/8." Signed in pencil. $750. With original label giving title. 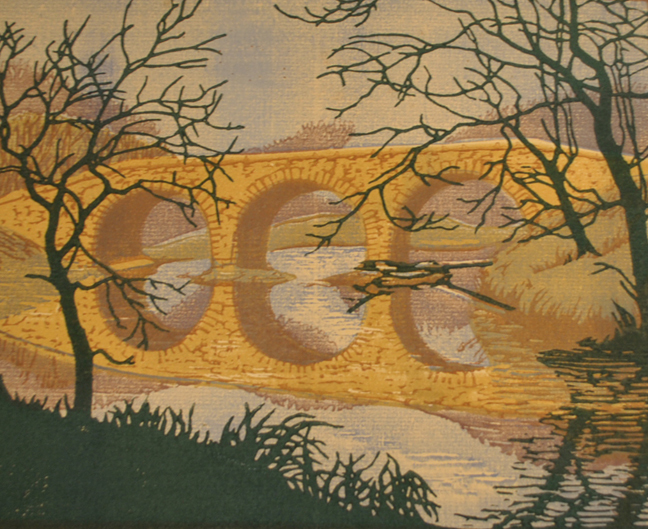 [TALL TREES, STREAM & SMALL STONE BRIDGE], color woodcut, c. 1930, 5 5/8 X 4 x 9 1/8." Signed in pencil. $750. "HARPER'S MAGAINE, CHRISTMAS 1898, color lithograph, 1898, 15 5/8 x 10 3/8.” Signed in the stone only as usual. $1750. Ellis’ works are rare. Pictured in color (Cat. No. 36) in Designed to Sell: Turn-of-the-Century American Posters. (Virginia Museum of Fine Arts Exhibit 1994-5). 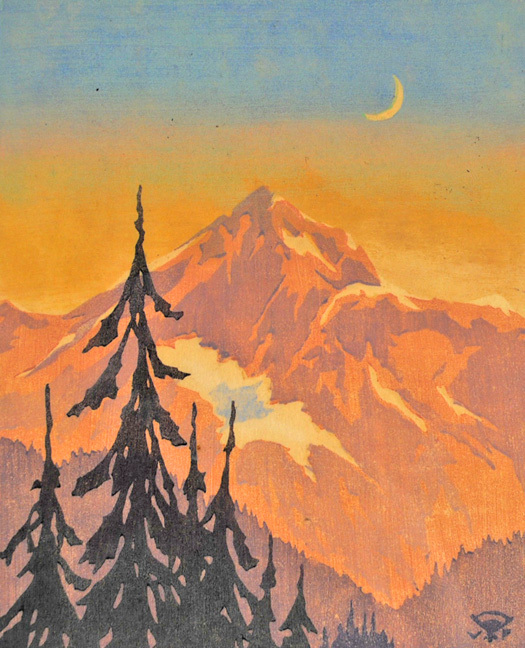 “EVENING IN THE ROCKIES,” color woodcut, c. 1926, 7 1/2 x 6.” Signed in pencil. $750. With a typed label on the reverse giving the title. The artist exhibited similar prints at the Print Maker’s Society of California exhibit in 1926. See Images of the Land: Canadian Block Prints 1919-1945 for more information. In original frame with a label from the Hudson’s Bay Co., Winnipeg. 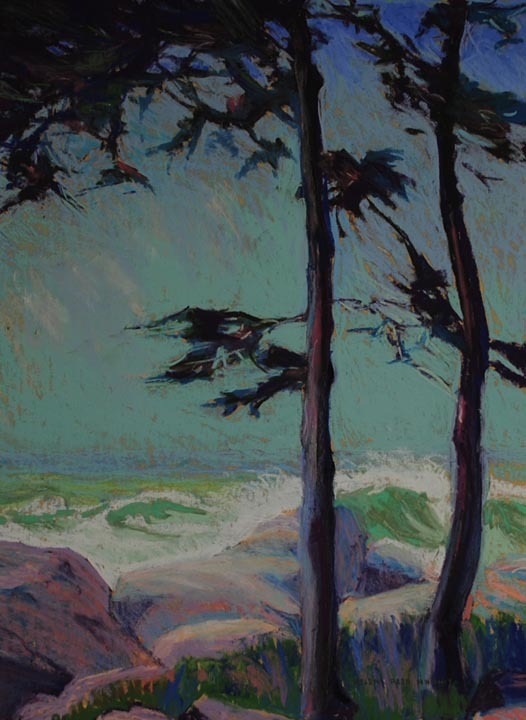 “PINES WINTER MORNING...*”, color etching & aquatint on silk, c. 1920-30, 17 1/4 x 14.” Signed in pencil. $495. 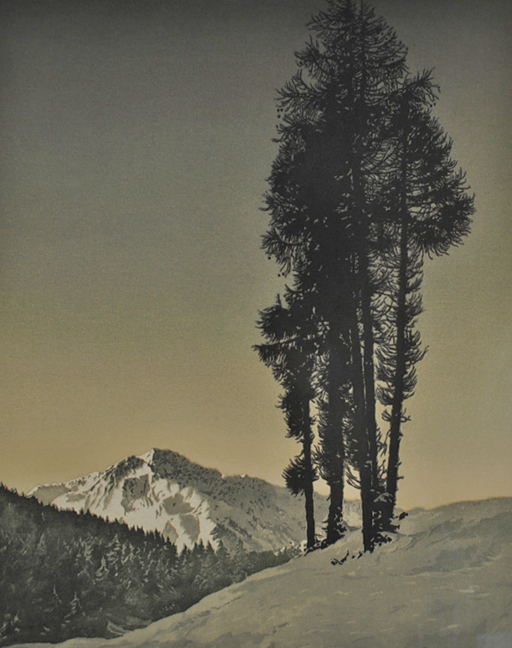 *”...Near Seefeld, Tyrol Alps, Austria.” Titled on original gallery label.Original frame. HOUSE IN WINTER, EVENING, platinum (?) 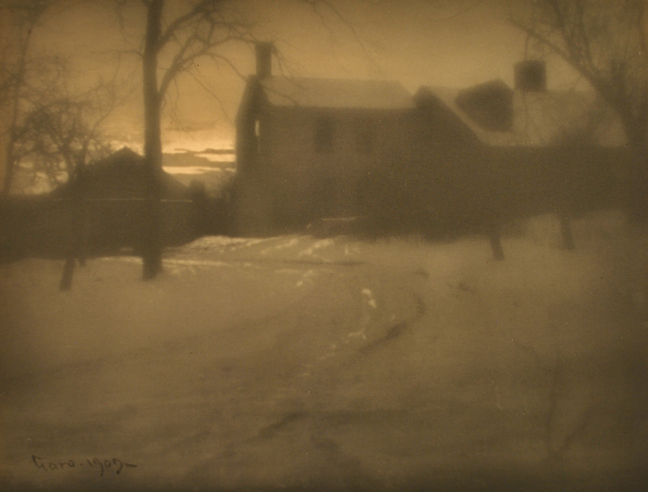 print, 1909, 9 x 11 1/4.” Signed & dated in ink in the photograph. pencil. $495. In original frame. President Calvin Coolidge chose Garo over John Singer Sargent for his official presidential portrait. In his day, Garo was a nationally acclaimed photographer, a leader in the thriving Boston photographic community. 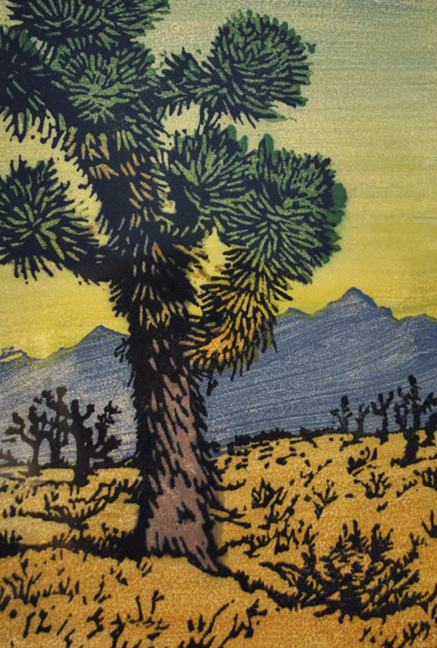 JOSHUA TREE, color woodcut, c. 1920-30, ed. small, 6 3/8 x 4 3/8.” Signed in pencil. $1950. 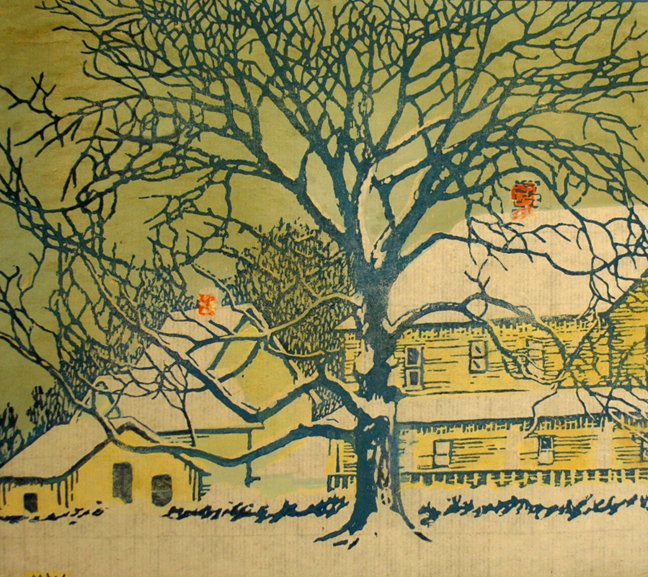 "CABIN IN THE BLUE RIDGE," color woodcut, 1940, P72, ed. 50, 9 1/2 x 12.” Signed in pencil. $1950. Another impression was shown in the Prairie Print Makers Exhibition in 1941 in Tulsa, Oklahoma. This is a cabin the Halls built in Bluemont, VA and I’m guessing that’s Arthur Hall on the porch. "DAILY BREAD," color woodcut, c. 1920-30, 8 x 9 5/8.” Signed in pencil. $525. 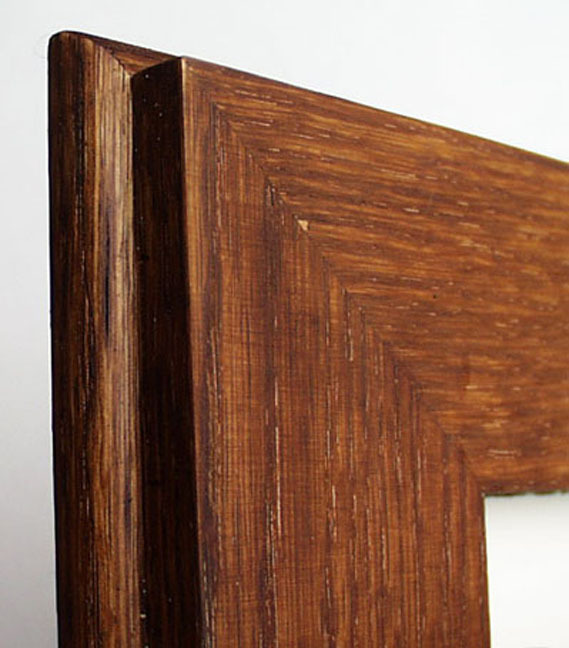 In original simple tan frame. I find reference to the artist in the New Canaan CT area. Known for illustration work for magazines in the 1910’s and 20’s as well as woodblock prints. 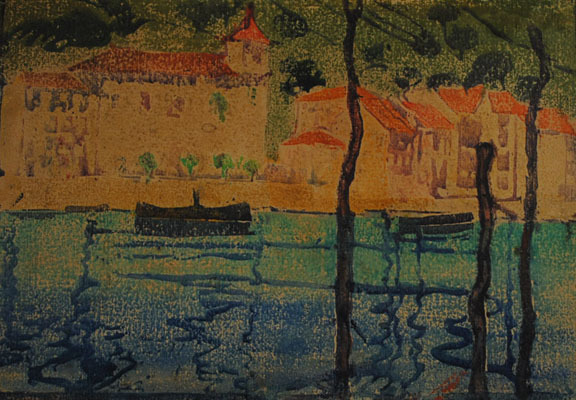 The style shows the influence of Arthur Wesley Dow. One could assume the artist studied with Dow or was exposed the his textbook Composition. Light creasing in image noticeable only under raking light. 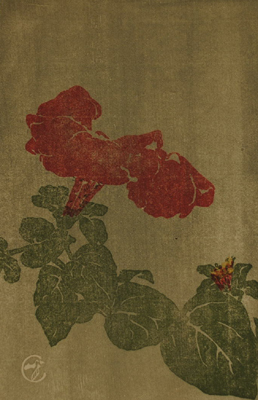 "PETUNIA," color woodcut, 1907-8, V51ii, 7 x 4 1/2." Signed with chop mark in block only. $750. Signed with the artist’s chop mark only. This original woodcut was bound into a high quality short-lived literary publication in 1908. It was printed “from the original blocks by careful working on a hand press.” There was also a “very limited” number of this image that was hand printed and signed in pencil (I have seen only one of those in 25+ years). 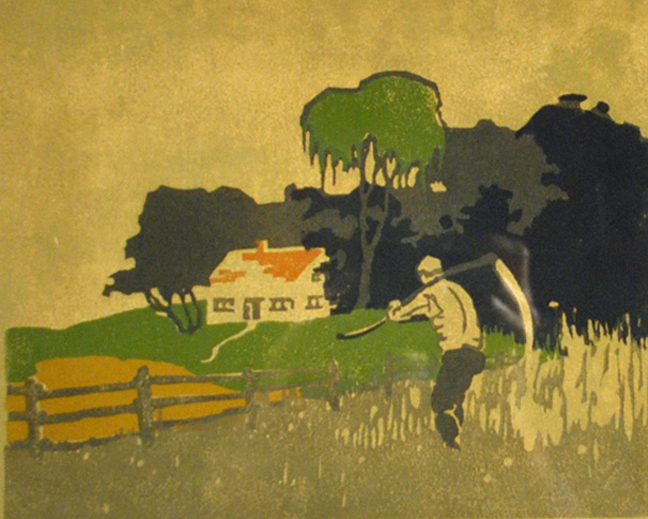 "AUGUST," color woodcut, 1914, M114, 7 1/8 x 2 3/4.” Signed in pencil. $675. Pictured in color on pg. 70 of Tim & Lynn Mason’s catalog, Helen Hyde. Another impression of this print is in the collection of The Library of Congress and another impression of this print was exhibited at the important Panama-Pacific Exposition in San Francisco in 1915. "A WEARY LITTLE MOTHER," color woodcut, 1914, M122, 4 3/8 X 4 1/2.” Signed in pencil. $625. 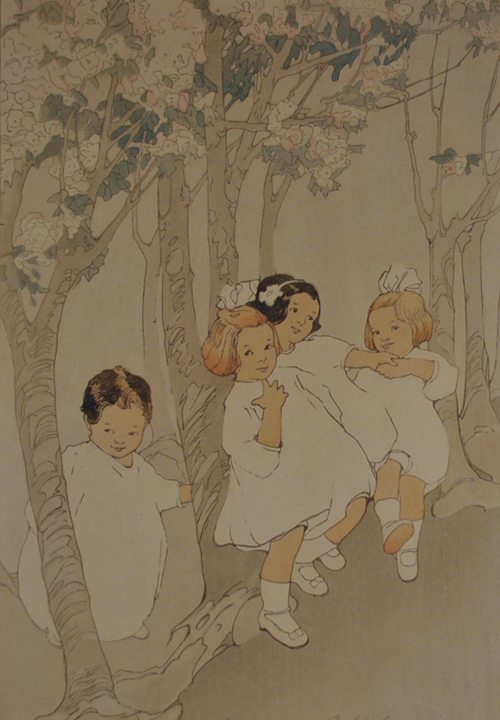 Other impressions of this print are in the collections of the Library of Congress and the Art Institute of Chicago. "THE RED CURTAIN," color woodcut, 1907, M74, 7 x 3 3/4.” Signed in pencil. $675. 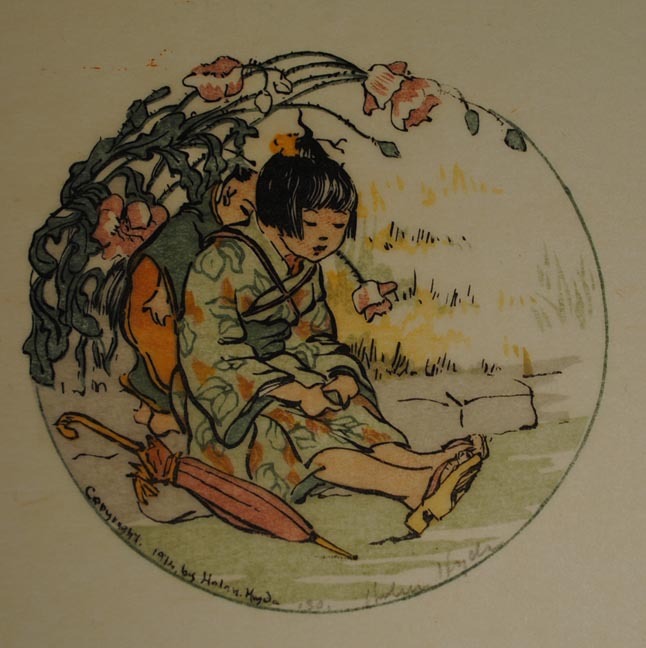 "A SUMMER GIRL," color woodcut, 1905, M62, 7 1/4 x 2 3/8.” Signed in pencil. $695. 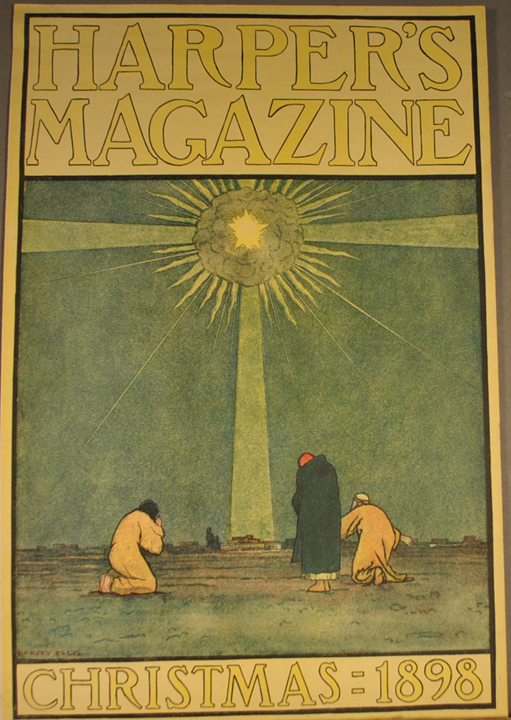 An impression of this print was exhibited at the important Panama-Pacific Exposition in San Francisco in 1915. 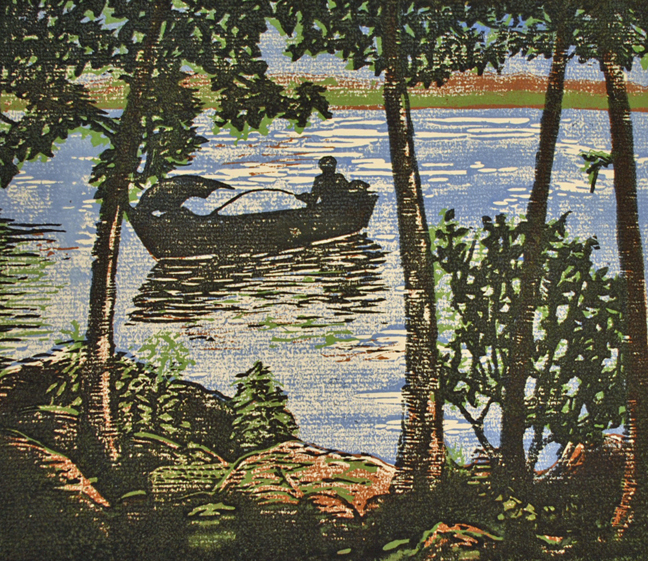 “AFTERGLOW--SHEEPSCOT RIVER, ME.," color woodcut, c. 1925-30, ed. 19/100, 8 x 6.” Signed in pencil. $1350. Judson was a member of the Boston Society of Arts & Crafts; elected a Craftsman in 1930 and promoted to Mastership in 1932. "TEMPLE IN RAIN," color woodcut, 1916, GP48, ed. >89, 10 1/4 x 4 3/4.” Signed in pencil. $1450. Also known as “Pagoda in Rain.” Provenance: Hirschl & Adler Galleries, New York. In a nice Arts & Crafts style gilt frame. Another impression of this print is in the collection of the Brooklyn Museum. "MOONRISE OVER A KYOTO HILLSIDE," color woodcut, 1934 B95, 6 7/8 x 9 3/8.” Signed in pencil. $850. Pictured in color on page 75 (Fig. 85) in Kendall Brown’s Between Two Worlds: The Life and Art of Lilian May Miller. Laid down. 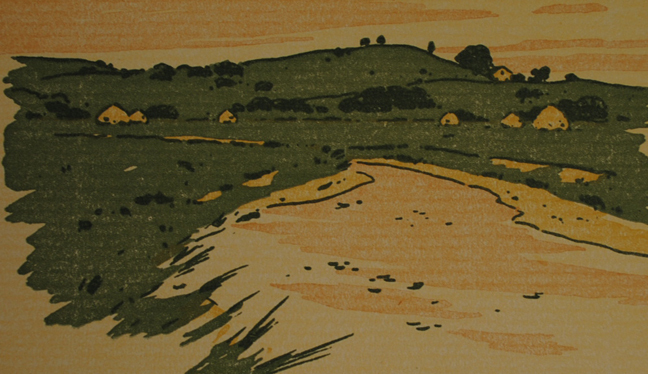 "VIEW OVER STARNBERGER LAKE," color woodcut, 1909, 9 3/4 x 14 1/2.” Signed in pencil. $675. Starnberger Lake is about 12 miles south of Munich. Light foxing in margin area. “AUGUST," color linocut, ed. 50, 8 1/8 x 6 3/8.” Signed in pencil. $375. 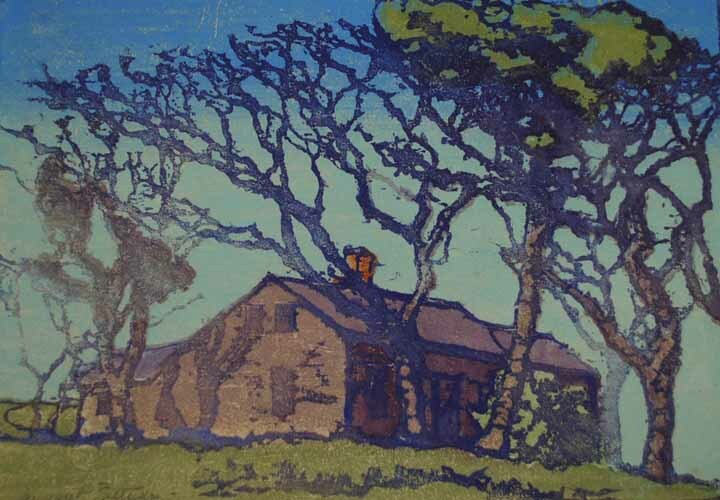 “CAPE COD HOUSE," color woodcut, c. 1920, 7 x 10 1/8.” Signed in pencil. $4500. A wonderful, richly-inked, impression. Trimmed to image by the artist and mounted by her on card as is common. “THE SANDS, CHATHAM” (Mass. 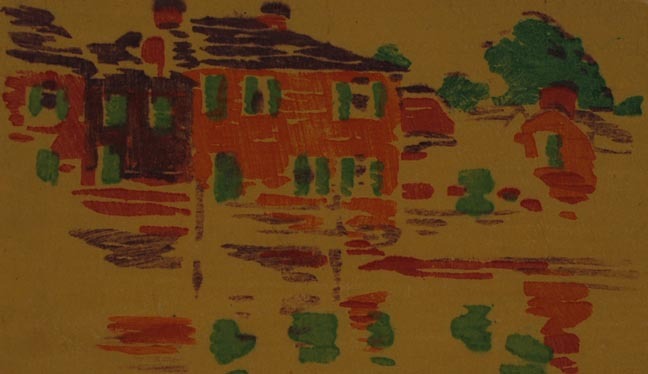 ), color woodcut, c. 1915, 7 1/8 x 10 1/8.” Unsigned. HOLD. 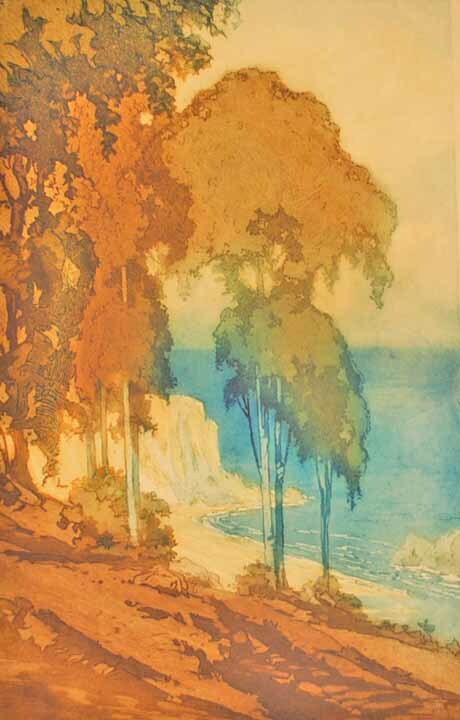 Another impression of this print was exhibited at the famed Panama-Pacific International Exposition in San Francisco in 1915. [SPANISH COASTAL TOWN], color woodcut, c. 1909, ed. very small, 6 5/8 9 ½.” Unsigned. $2250. This relates very strongly to an oil painting of the same title (Bakker 1990 catalog, #7, pictured). In 25+ years of dealing in the artist’s work, I’ve never seen this image. 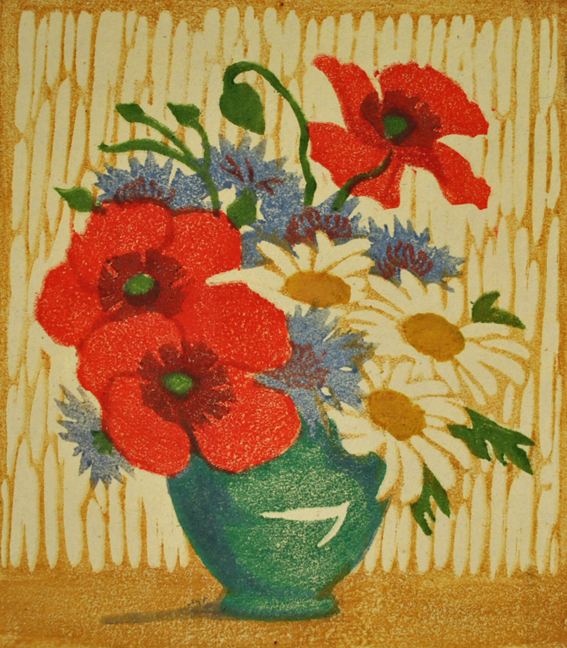 FLOWERS IN A VASE, color woodcut, c. 1920,8 x 7.” Signed in pencil. $525. The artist is presently unknown but numerous works by the artist appear in the states. Likely an Austrian or German artist. 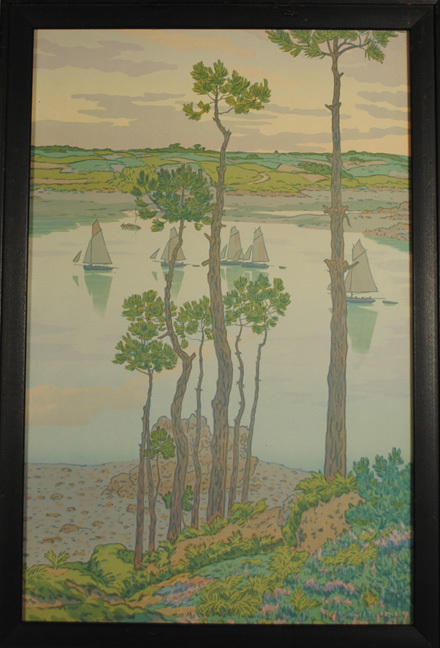 “LES BORDS DU TRIEUX AU CREPUSCULE,” color lithograph, 1903,13 1/4 x 8 5/8.” Signed in the stone only $375. Plate 6 from Riviere’s “Le Beau Pays de Bretagne” (”The Beautiful Country of Brittany”) series. Printed in 12 to 14 colors. The series had 20 prints and he printed one per year from 1898 to 1917, this being the 6th in the series. 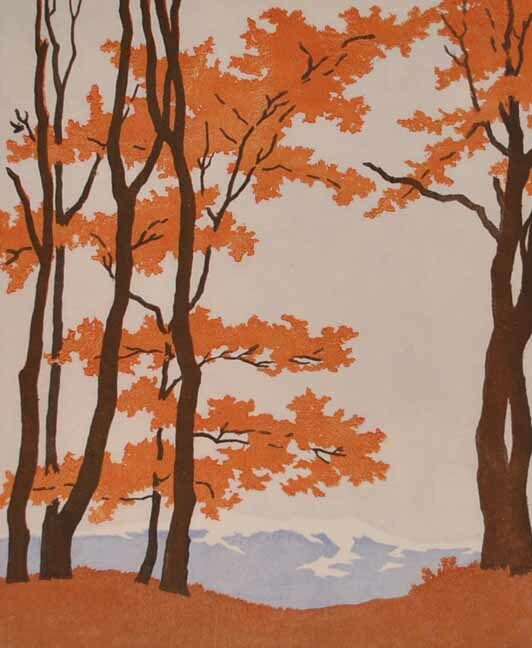 [AUTUMN TREES IN THE MOUNTAINS], color woodcut, 9 7/8 x 8.” Signed in pencil. $695. 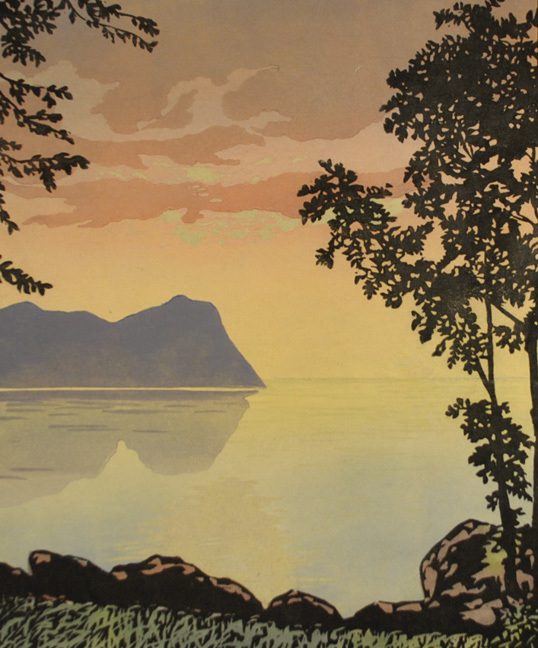 [TREES BY A MOUNTAIN LAKE], color woodcut,c. 1920, 8 1/8 x 6 3/4.” Signed in pencil. $595. Also signed in pencil on original mat and noted in pencil “Orig. Handdruck” (”Original Hand Printed”). [VENICE? 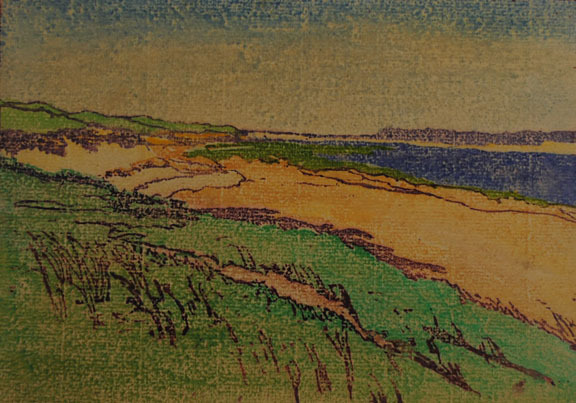 ], color woodcut, c.1920-30,4 1/2 X 6.” Signed in pencil. $450. 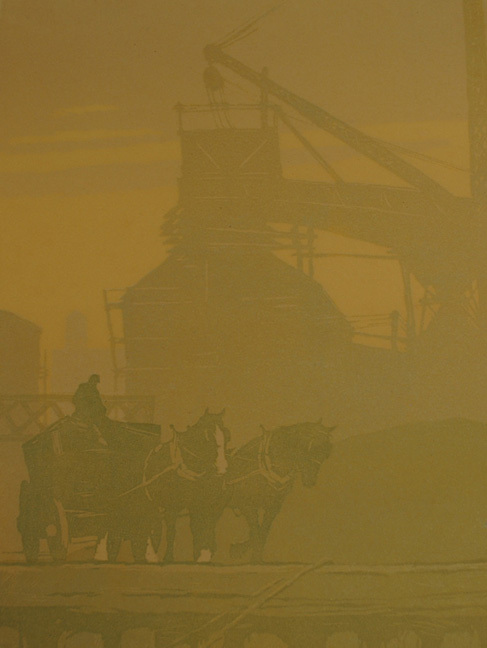 “COAL YARD,” color linocut, ed.100, 9 1/8 x 7 7/8.” Signed in pencil. $650. Very faint mat line, matted out. Few specks of light foxing in the margins. Good colors in this very atmospheric image. Watson received a degree from Pratt Institute in Brooklyn in 1907 and taught there from 1908 to 1929. 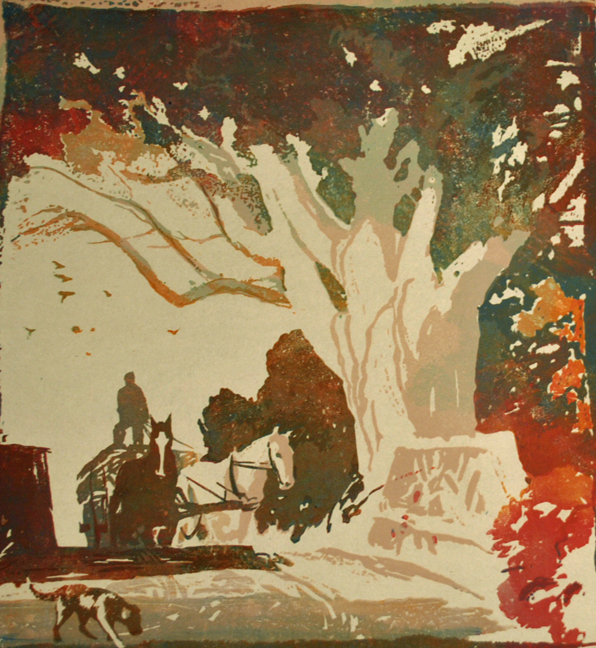 “FOREST ROAD,” color linocut, ed. 100, 9 1/8 x 6 1/2.” Signed in pencil. $795. Lovely colors. Dated March 1920 in the margin and noted “No. 14.” Watson received a degree from Pratt Institute in Brooklyn in 1907 and taught there from 1908 to 1929. 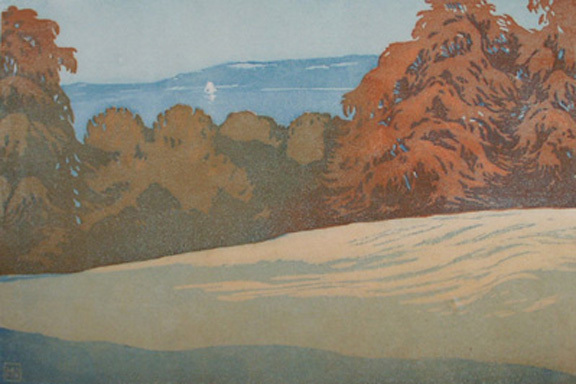 “OCTOBER DAY,” color linocut, c. 1925, ed. 100, 10 1/2 x 9 3/4.” Signed in pencil. $650. Watson received a degree from Pratt Institute in Brooklyn in 1907 and taught there from 1908 to 1929. 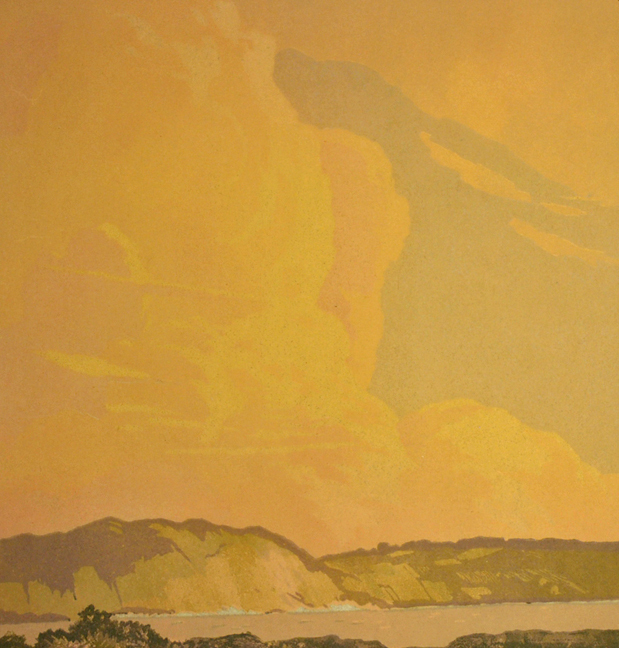 “THE HARBOR,” color linocut, 1922, ed. 100, 9 1/2 x 9 1/4.” Signed in pencil. $850. Dated January 1926 in the margin. Watson received a degree from Pratt Institute in Brooklyn in 1907 and taught there from 1908 to 1929. Margaret Whittemore (AMER. 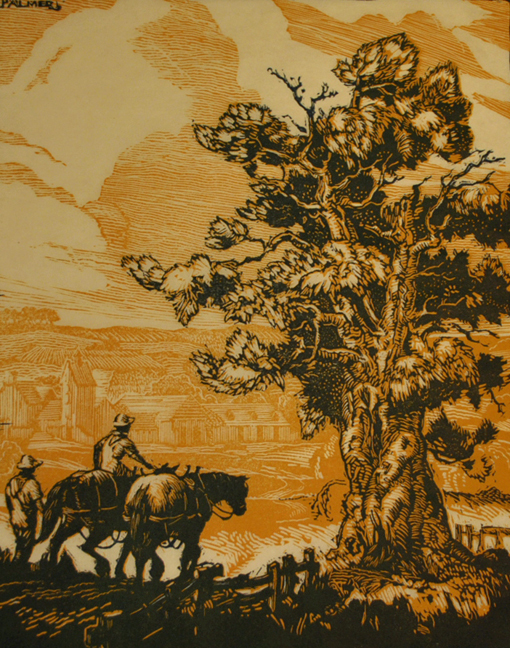 1897-1983)was a writer, graphic artist, illustrator, and member of the Prairie Print Makers. She earned a degree in 1919 from Washburn University, and studied at the Art Institute of Chicago and Taos Art Colony. “ON THE LAKE,” color linocut, 7 3/4 x 9.” Signed in pencil. $495. 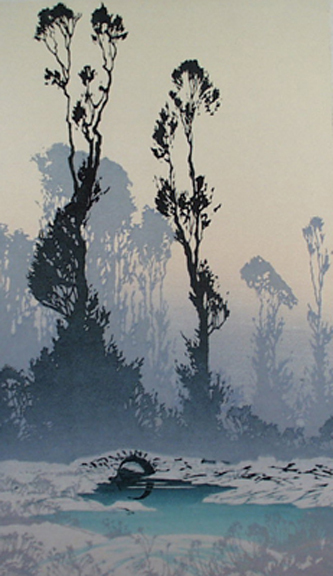 In over 35 years of dealing in woodblock prints, I hadn’t seen any works by this artist. 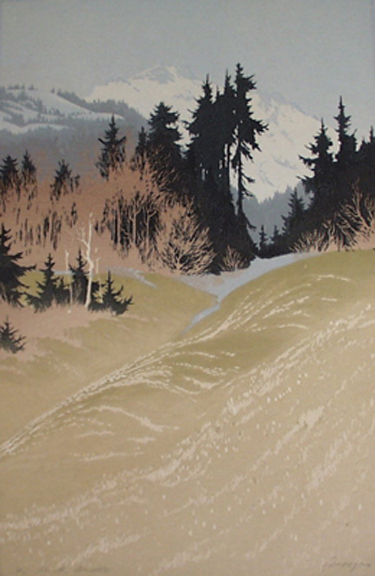 Most in the art world know of his work but his woodblocks have rarely been seen. Womrath was born near Philadelphia in 1874. He moved to London to study, and then went to Paris, working in both cities for several years. 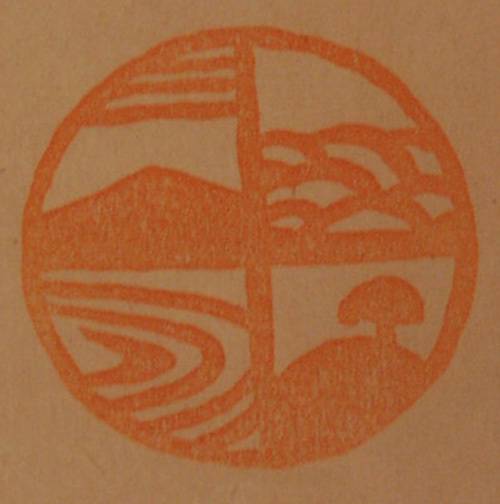 He studied woodblock printing under Urushibara Mokuchu, who bought many of his works. The British Museum has a number of his color woodcuts in their collection. 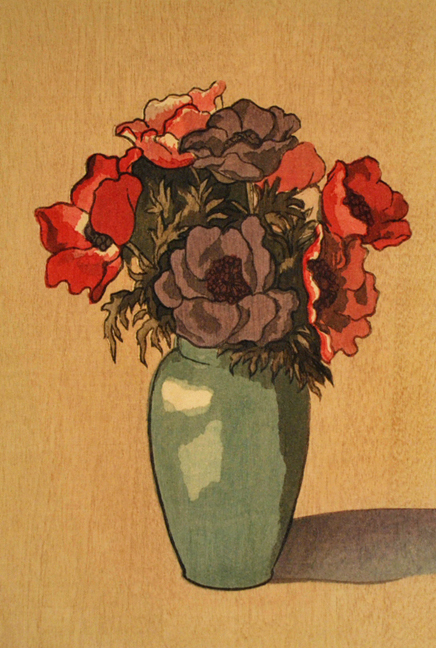 “ANEMONES,” color woodcut, c. 1920, 9 x 6 1/8.” Signed in pencil. $650. 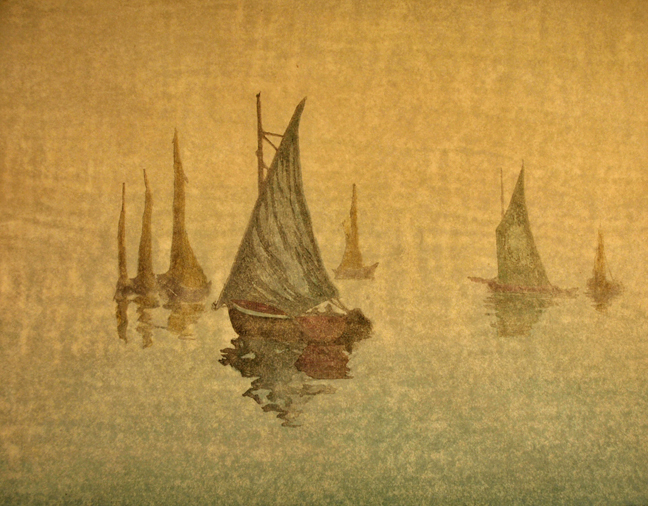 BOATS IN FOG, color woodcut, c. 1920, 9 x 11 3/4.” Signed in pencil. $550. 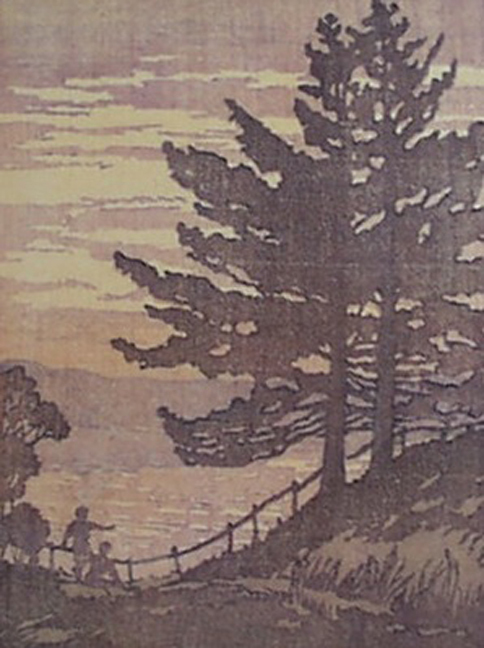 “CREPUSCULE" ("Twilight"), color woodcut, c. 1920, 5 1/2 x 7 3/8.” Unsigned. $625. An early state printed without the key block that was used in the above impression. Both imoressions are successfuland are an interesting study when viewed together. 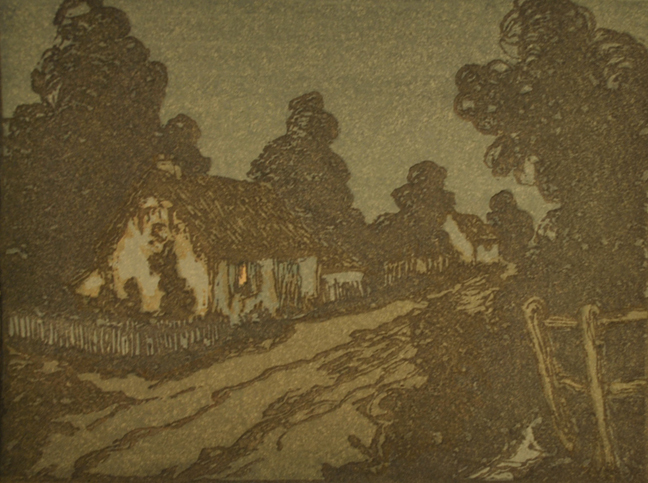 VILLAGE STREET, color woodcut, c. 1920, ed. 14, 5 x 6 1/2.” Signed in pencil. $525. 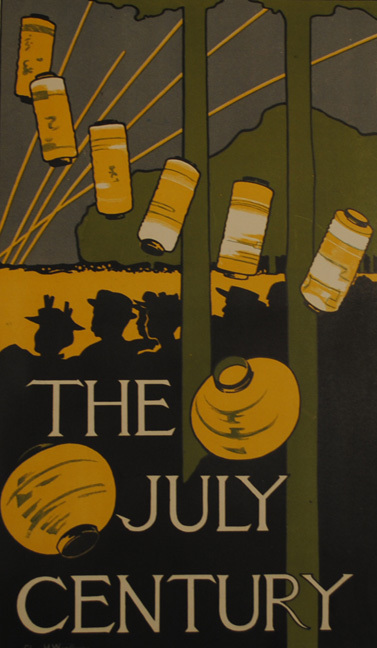 “THE CENTURY JULY ,” color lithograph, c. 1897, 12 1/8 x 7 1/2.” Signed in the stone only. $595. This is the from “Les Maitres de l’Affiche” portfolio, plate #32 and, as is the case with all of the “Maitres,” is smaller than the original but identical in all other respects. Small pressure mark by third lantern.